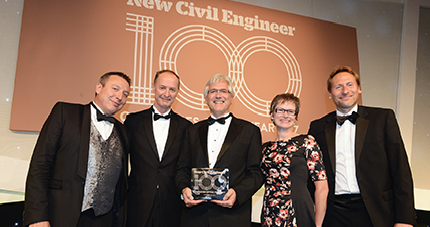 Westlakes Engineering Limited were celebrating at the New Civil Engineer 100 Companies of the Year 2017 Dinner on 22nd June, held at the Hilton Park Lane Hotel, London, when they were named SME of the Year for 2017. The evening proved to be an even greater success as following on from its award as SME of the year, Westlakes were also announced as ranked 7th overall on the NCE top 100 list, moving up three places from last year’s number 10 position. The top 20 was largely filled by multinationals, making the ranking of 7th against such well respected companies an even greater achievement. The NCE100 is a totally independent, authoritative assessment of what it means to be an excellent civil engineering practice. The assessment is made against New Civil Engineer’s five core pillars; the competencies and passions sought in outstanding firms: technical excellence; technology leadership; talent development; action on equality and global leadership. Sitting on top of that is an assessment of a key behaviour sought in civil engineering today: collaboration. Competition to enter the NCE100 was fierce this year, with 26 new entries causing many firms to fail to make the 100 at all. Surveys were carried out between December 2016 and March 2017 and judging took place in May. Andy Hooper, Managing Director of Westlakes Engineering said “It’s fantastic for all of us at Westlakes to receive this recognition. To be ranked 7th in our industry, ahead of many of our peers, and to be crowned the UK’s SME of the Year 2017 to NCE is an amazing achievement. Our mission is to make sure we maintain the highest of standards for our staff and our clients, and push ourselves to continue to improve the business and see if we could do equally as well next year”.